Happy Tuesday. Happy almost end of summer and Happy beginning of August! OMG! Why all of this HAPPINESS stuff?! Well, why not? Why not be HAPPY? Why not look for what's right? Why not be grateful for what is, and look for the silver lining, and look for the lesson? You know, many people characterize me as a 'Pollyanna' personality. They ask me if I'm always this up and HAPPY. They 'make up' that I NEVER have a bad day and almost revel in the fact that 'bad things' happen to me, that I can be depressed and have enormously down days. and observation of it. My reality is only as true, real and valid as I expect it to be. It is after all, MY STORY. We ALL have our Stories. We all have beliefs, attitudes, behaviors, expectations and genetic propensities that create our lives, day after day after day after day. OMG! That's sound's so boring. It feels so grueling. No wonder I choose to be HAPPY! Today allow me to share a little HAPPINESS with you. My friend Simran Singh (Simmie) and I have re-started our 'Conversations With My Self' TV Show. It's inspiring, dynamic, provocative, informative and engaging conversations between two deeply wise, contemplative, and playful individuals. This week's show is called, 'The STORY'. Does your story empower you or limit you? Does your story inspire you to greatness or hide your potential? Does it make you HAPPY, and have you look for the lesson's in your life, or have you live your life day after day after day (boring and grueling) in the doom and gloom of oppression and victimhood. I raise my hand for HAPPINESS and invite you to join us. Our conversation today brings in the dynamics of Human Design, The Gene Keys, and Simran's gift at reading signs, symbols and synchronicities in life. What if you were given a blueprint of your conscious potential? What if you were able to use that blueprint along with the signs, symbols and synchronicities to create a life of purpose and service, empowering partnerships, prosperity, harmony, and beauty? 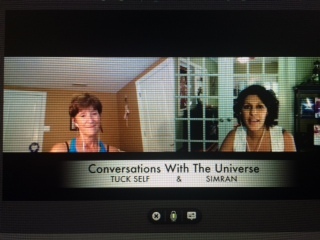 Join Simran and me each week at 8 PM ET on CCN - Conscious Consumer Network for 'Conversations With My Self'. You'll be HAPPY if you do!!! !